New Brunswick is one of four Atlantic provinces on the east coast of Canada. According to the Constitution of Canada, New Brunswick is the only bilingual province. About two thirds of the population declare themselves anglophones and a third francophones. One third of the population describes themselves as bilingual. Atypically for Canada, only about half of the population lives in urban areas, mostly in Greater Moncton, Greater Saint John and the capital Fredericton. Without making distinctions between the Acadians who had been neutral and those who had resisted the occupation of Acadia, the British governor Charles Lawrence and the Nova Scotia Council ordered them to be expelled. [lower-alpha 5] In the first wave of the expulsion, Acadians were deported to other British North American colonies. During the second wave, they were deported to Britain and France, and from there a significant number migrated to Spanish Louisiana, where 'Acadians' eventually became 'Cajuns'. Acadians fled initially to Francophone colonies such as Canada, the uncolonized northern part of Acadia, Île Saint-Jean (present-day Prince Edward Island) and Île Royale (present-day Cape Breton Island). During the second wave of the expulsion, these Acadians were either imprisoned or deported. 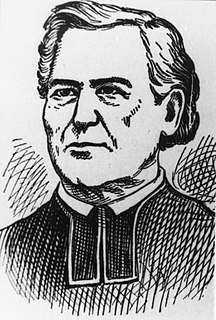 Brigadier-General Charles Lawrence was a British military officer who, as lieutenant governor and subsequently governor of Nova Scotia, is perhaps best known for overseeing the Expulsion of the Acadians and settling the New England Planters in Nova Scotia. He was born in Plymouth, England and died in Halifax, Nova Scotia. According to historian Elizabeth Griffiths, Lawrence was seen as a "competent", "efficient" officer with a "service record that had earned him fairly rapid promotion, a person of considerable administrative talent who was trusted by both Cornwallis and Hopson." He is buried in the crypt of St. Paul's Church (Halifax). The Nova Scotia Council (1720–1758) was the British administrative and judicial body in Nova Scotia. The Nova Scotia Council was also known as the Council of Nova Scotia, the Annapolis Council and the Halifax Council. After 1749, the Nova Scotia Council was limited to administrative powers and the judicial courts are set separately. Along with the British achieving their military goals of defeating Louisbourg and weakening the Mi'kmaq and Acadian militias, the result of the Expulsion was the devastation of both a primarily civilian population and the economy of the region. Thousands of Acadians died in the expulsions, mainly from diseases and drowning when ships were lost. On July 11, 1764, the British government passed an order-in-council to permit Acadians to legally return to British territories, provided that they take an unqualified oath of allegiance. The American poet Henry Wadsworth Longfellow memorialized the historic event in his poem about the plight of the fictional character Evangeline , which was popular and made the expulsion well known. Henry Wadsworth Longfellow was an American poet and educator whose works include "Paul Revere's Ride", The Song of Hiawatha, and Evangeline. He was also the first American to translate Dante Alighieri's Divine Comedy and was one of the Fireside Poets from New England. Evangeline, A Tale of Acadie is an epic poem by the American poet Henry Wadsworth Longfellow, written in English and published in 1847. The poem follows an Acadian girl named Evangeline and her search for her lost love Gabriel, set during the time of the Expulsion of the Acadians. Other Acadians refused to sign an unconditional oath because they were anti-British. 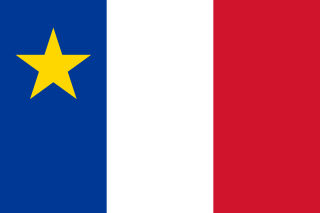 Various historians have observed that some Acadians were labelled "neutral" when they were not. By the time of the Expulsion of the Acadians, there was already a long history of political and military resistance by Acadians and the Wabanaki Confederacy to the British occupation of Acadia. 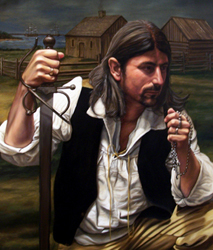 The Mi'kmaq and the Acadians were allies through their Catholicism and numerous inter-marriages. While the Acadians were the largest population, the Wabanaki Confederacy, particularly the Mi'kmaq, held the military strength in Acadia even after the British conquest. They resisted the British occupation and were joined on numerous occasions by Acadians. These efforts were often supported and led by French priests in the region. The Wabanaki Confederacy and Acadians fought against the British Empire in six wars, including the French and Indian Wars, Father Rale's War and Father Le Loutre's War, over a period of seventy-five years. The Wabanaki Confederacy are a First Nations and Native American confederation of five principal nations: the Mi'kmaq, Maliseet, Passamaquoddy, Abenaki, and Penobscot. On November 17, 1755, George Scott took 700 troops, attacked twenty houses at Memramcook, arrested the remaining Acadians and killed two hundred head of livestock to deprive the French of supplies. Acadians tried to escape the expulsion by retreating to the St. John and Petitcodiac rivers, and the Miramichi in New Brunswick. The British cleared the Acadians from these areas in the later campaigns of Petitcodiac River, Saint John River, and the Gulf of St. Lawrence in 1758. In the first wave of the expulsion, most Acadian exiles were assigned to rural communities in Massachusetts, Connecticut, New York, Pennsylvania, Maryland and South Carolina. In general, they refused to stay where they were put and large numbers migrated to the colonial port cities where they gathered in isolated, impoverished French-speaking Catholic neighbourhoods, the sort of communities Britain's colonial officials tried to discourage. More worryingly for the British authorities, some Acadians threatened to migrate north to French-controlled regions, including the Saint John River, Île Royale (Cape Breton Island), the coasts of the Gulf of St. Lawrence and Canada. Because the British believed their policy of sending the Acadians to the Thirteen Colonies had failed, they deported the Acadians to France during the second wave of the Expulsion. Louisiana was transferred to the Spanish government in 1762. Because of the good relations between France and Spain, and their common Catholic religion, some Acadians chose to take oaths of allegiance to the Spanish government. Soon the Acadians comprised the largest ethnic group in Louisiana. They settled first in areas along the Mississippi River, then later in the Atchafalaya Basin, and in the prairie lands to the west—a region later renamed Acadiana. Faragher compared the expulsions to contemporary acts of ethnic cleansing. In contrast, numerous leading historians have objected to this characterization of the expulsion. Historian John Grenier asserts that Faragher overstates the religious motivation for the expulsion and obscures the fact that the British accommodated Acadians by providing Catholic priests for forty years prior to the Expulsion. Grenier writes that Faragher "overstates his case; his focus on the grand dérangement as an early example of ethnic cleansing carries too much present-day emotional weight and in turn overshadows much of the accommodation that Acadians and Anglo-Americans reached." As well, the British were clearly not concerned that the Acadians were French, given the fact that they were recruiting French foreign protestants to settle in the region. Further, the New Englanders of Boston were not banishing Acadians from the Atlantic region; instead, they were actually deporting them to live in the heart of New England: Boston and elsewhere in the British colonies. Wikimedia Commons has media related to Expulsion of the Acadians . ↑ The term "forced removal" is being used intentionally. For the academic discussions about referring to this event as "ethnic cleansing" or a "deportation" see the Historical Comparisons section. 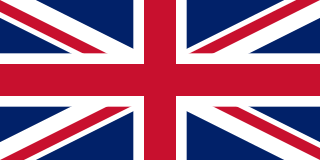 ↑ This conflict is also referred to as "Anglo French Rivalry of 1749–63" and War of British Conquest. ↑ Note that Faragher (2005), p. 405, indicates that Monckton had a force of 2000 men for this campaign. ↑ A letter from Fort Frederick which was printed in "Parker's New York Gazette or Weekly Post-Boy". April 2, 1759. provides additional details of the behaviour of the Rangers. ↑ Total exiles for Britain and France found in Leblanc, Robert A. (April 1979). "Les migrations acadiennes". Cahiers de géographie du Québec. 23 (58): 99–124. doi:10.7202/021425ar. Port La Tour is a community in the Canadian province of Nova Scotia, located in the Barrington Municipal District of Shelburne County. The Siege of Annapolis Royal in 1744 involved two of four attempts by the French, along with their Acadian and native allies, to regain the capital of Nova Scotia/Acadia, Annapolis Royal, during King George's War. 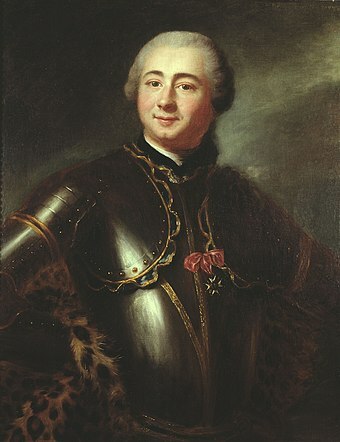 The Siege is noted for Governor of Nova Scotia Paul Mascarene successfully defending the last British outpost in the colony and for the first arrival of New England Ranger John Gorham to Nova Scotia. The French and Mi'kmaq land forces were thwarted on both attempts on the capital because of the failure of French naval support to arrive. 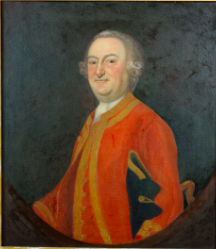 John Gorham was a New England Ranger and was the first significant British military presence on the frontier of Nova Scotia and Acadia to remain in the region for a substantial period after the Conquest of Acadia (1710). He established the famous "Gorham's Rangers". He also commissioned two armed vessels: the Anson and the Warren, who patrolled off Nova Scotia. The Battle at St. Croix was fought during Father Le Loutre's War between New England Rangers and Mi'kmaq at Battle Hill in the community of St. Croix, Nova Scotia. The battle lasted for three days in the spring of 1750, March 20–23. The Raid on Dartmouth occurred during Father Le Loutre's War on May 13, 1751 when a Mi'kmaq and Acadia militia from Chignecto, under the command of Acadian Joseph Broussard, raided Dartmouth, Nova Scotia, destroying the town and killing twenty British villagers and wounding British regulars. The town was protected by a blockhouse on Blockhouse Hill with William Clapham's Rangers and British regulars from the 45th Regiment of Foot. This raid was one of seven the Natives and Acadians would conduct against the town during the war. The Petitcodiac River Campaign was a series of British military operations from June to November 1758, during the French and Indian War, to deport the Acadians that either lived along the Petitcodiac River or had taken refuge there from earlier deportation operations, such as the Ile Saint-Jean Campaign. Under the command of George Scott, William Stark's company of Rogers Rangers, Benoni Danks and Gorham's Rangers carried out the operation. 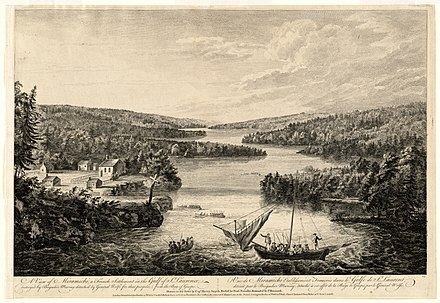 The Siege of Grand-Pré happened during Father Le Loutre's War and was fought between the British and the Wabanaki Confederacy and Acadian militia. The siege happened at Fort Vieux Logis, Grand-Pré. The native and Acadia militia laid siege to Fort Vieux Logis for a week in November 1749. One historian states that the intent of the siege was to help facilitate the Acadian Exodus from the region. 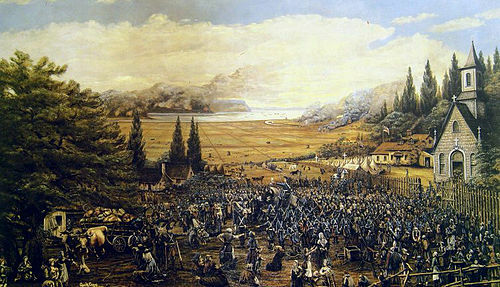 The Bay of Fundy Campaign occurred during the French and Indian War when the British ordered the Expulsion of the Acadians from Acadia after the Battle of Fort Beauséjour (1755). The Campaign started at Chignecto and then quickly moved to Grand-Pré, Rivière-aux-Canards, Pisiguit, Cobequid, and finally Annapolis Royal. Approximately 7,000 Acadians were deported to the New England colonies. Fort Sackville was a British fort located in present-day Bedford, Nova Scotia that was built during Father Le Loutre's War. The British built the fort adjacent to present-day Scott Manor House, on a hill overlooking the Sackville River to help prevent French, Acadian and Mi'kmaq attacks on Halifax. The fort consisted of a blockhouse, a guard house, a barracks which housed 50 soldiers, and outbuildings, all encompassed by a palisade. Not far from the fort was a rifle range. The fort was named after George Germain, 1st Viscount Sackville. Miꞌkmaq militias were made up of Miꞌkmaq warriors (smáknisk) who worked independently as well as in coordination with the Wabanaki Confederacy, French and Acadian forces throughout the colonial period to defend their homeland Miꞌkmaꞌki against the English. 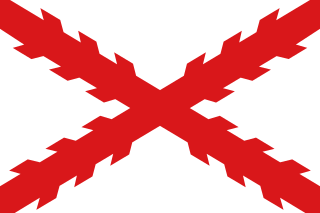 The Miꞌkmaq militias deployed effective resistance for over 75 years before the Halifax Treaties were signed (1760–61). In the nineteenth century, the Miꞌkmaq "boasted" that, in their contest with the British, the Miꞌkmaq "killed more men than they lost". In 1753, Charles Morris stated that the Miꞌkmaq have the advantage of "no settlement or place of abode, but wandering from place to place in unknown and, therefore, inaccessible woods, is so great that it has hitherto rendered all attempts to surprise them ineffectual". Leadership on both sides of the conflict employed standard colonial warfare, which included scalping non-combatants. 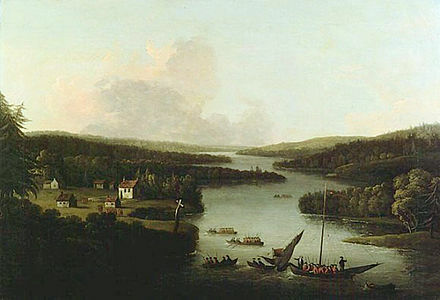 After some engagements against the British during the American Revolution, the militias were dormant throughout the nineteenth century, while the Miꞌkmaq people used diplomatic efforts to have the local authorities honour the treaties. After confederation, Miꞌkmaq warriors eventually joined Canada's war efforts in World War I and World War II. The most well-known colonial leaders of these militias were Chief (Sakamaw) Jean-Baptiste Cope and Chief Étienne Bâtard. The Cape Sable Campaign occurred during the French and Indian War when Colonel Roger Morris led a force of 325 British soldiers, Captain Joseph Gorham led 60 rangers and Roger's Rangers to destroy the Acadian settlements in present-day Shelburne County and Yarmouth County, Nova Scotia, Canada, in the fall of 1758. ↑ Pothier, Bernard (1974). "LeBlanc, Joseph". In Halpenny, Francess G. Dictionary of Canadian Biography . III (1741–1770) (online ed.). University of Toronto Press. ↑ d’Entremont, C. J. (1974). "Bourg, Belle-Humeur, Alexandre". In Halpenny, Francess G. Dictionary of Canadian Biography . III (1741–1770) (online ed.). University of Toronto Press. ↑ Johnson, Micheline D. (1974). "Manach, Jean". In Halpenny, Francess G. Dictionary of Canadian Biography . III (1741–1770) (online ed.). University of Toronto Press. 1 2 Plank (2001), p. 149. ↑ White, Stephen A. (2005). "The True Number of Acadians". In Ronnie Gilles LeBlanc. Du Grand Dérangement à la Déportation: nouvelles perspectives historiques. Université de Moncton. pp. 21–56. ISBN 978-1-897214-02-2. ↑ "An Estimate of the Inhabitants in Nova Scotia, A.D. 1764. By Hon. 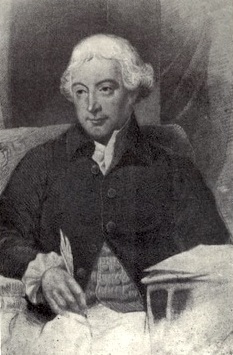 Alexander Grant, Esq. at the Request of Dr. Stiles". Collections of the Massachusetts Historical Society. Vol. X. Boston: Munroe, Francis, and Parker. 1809. p. 82. 1 2 3 4 Grenier (2008). ↑ Patterson, Stephen E. (1998). "Indian-White Relations in Nova Scotia, 1749-61: A Study in Political Interaction". In P.A. Buckner; Gail G. Campbell; David Frank. The Acadiensis Reader: Atlantic Canada Before Confederation (3rd ed.). Acadiensis Press. pp. 105–106. ISBN 978-0-919107-44-1. ↑ Faragher (2005), p. 337. ↑ Basque, Maurice (2004). "Family and Political Culture in Pre-Conquest Acadia". In John G. Reid; et al. The "Conquest" of Acadia, 1710: Imperial, Colonial, and Aboriginal Constructions. University of Toronto Press. p. 49. doi:10.3138/9781442680883. ISBN 978-0-8020-8538-2. JSTOR 10.3138/9781442680883.8. • Reid, John G. (1994). "1686–1720: Imperial Intrusions". In Phillip Buckner; John G. Reid. The Atlantic Region to Confederation: A History. University of Toronto Press. p. 83. ISBN 978-1-4875-1676-5. JSTOR j.ctt15jjfrm. • Barnes, Thomas Garden (1996). "'Twelve Apostles' or a Dozen Traitors? Acadian Collaborators during King George's War 1744-8.". In F. Murray Greenwood; Barry Wright. Canadian State Trials: Law, Politics, and Security Measures, 1608-1837. Osgoode Society for Canadian Legal History. ISBN 978-1-4875-9790-0. 1 2 Faragher (2005), pp. 110–112. ↑ Plank (2001), p. 72. ↑ Plank (2001), p. 67. ↑ Grenier, John (2005). The First Way of War: American War Making on the Frontier, 1607–1814. Cambridge University Press. ISBN 978-1-139-44470-5. ↑ Patterson (1994), p. 146. ↑ Patterson (1994), p. 152. ↑ Grenier (2008), pp. 177–206. ↑ Patterson (1994), p. 148. ↑ Faragher (2005), p. 338. ↑ Grenier (2008), p. 184. 1 2 Faragher (2005), p. 398. ↑ Grenier (2008), p. 190. 1 2 "The New Brunswick Military Heritage Project". ↑ Grenier (2008), p. 195. ↑ Faragher (2005), p. 410. ↑ Brodhead, John Romeyn (1858). "M. Lotbinière to the Minister". Documents Relative to the Colonial History of the State of New York. Vol. X. Albany: Weed, Parsons and Co. p. 496. ↑ Faragher (2005), pp. 110-112. ↑ "The Journal of John Weatherspoon". Collections of the Nova Scotia Historical Society for the Years 1879–1880. Volume II. Halifax. 1881. pp. 31–62. ↑ Bell (1961), p. 503. 1 2 McMechan, Archibald (1931). Red Snow of Grand-Pré. McClelland & Stewart. p. 192. ↑ Bell (1961), p. 509. ↑ Bell (1961), pp. 510, 513. ↑ Bell (1961), p. 510. 1 2 Bell (1961), p. 511. 1 2 Bell (1961), p. 512. ↑ Bell (1961), p. 513. ↑ Bell (1961), p. 504. 1 2 Landry, Peter (2007). The Lion and the Lily. Trafford. ISBN 978-1-4251-5450-9. 1 2 3 Grenier (2008), p. 198. 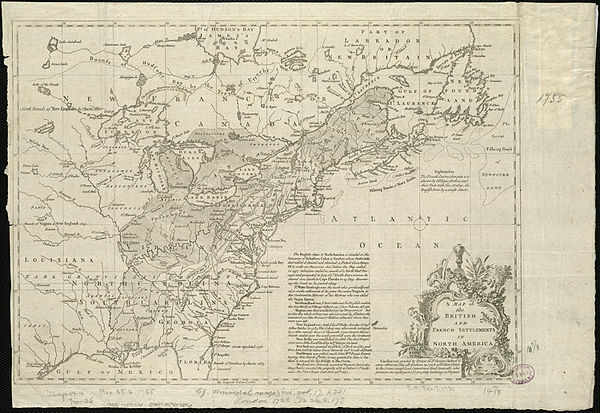 ↑ "Nova Scotia - Major Morris Report - 1758". Collections of the Massachusetts Historical Society. Vol. IX: Fourth Series. Boston. 1871. p. 222. ↑ Murdoch, Beamish (1866). A History of Nova-Scotia, Or Acadie. Vol. II. Halifax: J. Barnes. p. 373. ↑ Murdoch (1866), p. 375. 1 2 Murdoch (1866), p. 366. ↑ Lockerby (2008), p. 70. ↑ Plank (2001), p. 160. 1 2 3 Grenier (2008), pp. 199-200. ↑ McLennan (1918), pp. 417–423, Appendix XI. ↑ Lockerby (2008), pp. 17, 24, 26, 56. • Smethurst, Gamaliel (1905) . W.F. Ganong, ed. A Narrative of an Extraordinary Escape: out of the Hands of the Indians, in the Gulph of St. Lawrence. London: New Brunswick Historical Society. ↑ McLennan (1918), p. 190. ↑ Lockerby, Earle (June 2011). "Pre-Deportation Letters from Île Saint Jean". Les Cahiers. La Societe hitorique acadienne. 42 (2): 99–100. ↑ Loescher, Burt Garfield (1969). Rogers Rangers: The First Green Berets. San Mateo, California. p. 29. ↑ Bell (1961), p. 508. ↑ Griffiths (2005), p. 438. ↑ Faragher (2005), pp. 423–424. ↑ Williamson (1832), pp. 311-312. • Leblanc, Phyllis E. (1979). "Deschamps de Boishébert et de Raffetot, Charles". In Halpenny, Francess G. Dictionary of Canadian Biography . IV (1771–1800) (online ed.). University of Toronto Press. ↑ Plank (2001), p. 70. ↑ "French Neutrals In Maine". Collections of the Maine Historical Society. Vol. VI. Portland, Maine. 1859. ↑ Arsenault (2004), p. 197. ↑ Faragher (2005), p. 374. ↑ Rieder & Rieder (1977), p. 1. ↑ Arsenault (2004), p. 153. ↑ Arsenault (2004), p. 156. 1 2 3 Arsenault (2004), p. 157. 1 2 Faragher (2005), p. 386. ↑ Faragher (2005), p. 389. ↑ Rieder & Rieder (1977), p. 2. ↑ LeBlanc, Dudley J. (1932). The True Story of the Acadians. p. 48. ↑ Doughty (1916), p. 140. ↑ Arsenault (2004), p. 160. ↑ Faragher (2005), p. 388. ↑ Scott, Shawn; Scott, Tod (2008). "Noel Doiron and the East Hants Acadians". Journal of the Royal Nova Scotia Historical Society . 11: 45–60. ↑ Laxer, James (May 14, 2010). The Acadians: In Search of a Homeland. Doubleday Canada. p. 80. ISBN 978-0-385-67289-4 . Retrieved August 9, 2013. ↑ Tallant, Robert (2000). Evangeline and the Acadians. Pelican Publishing. p. 85. ISBN 978-1-4556-0393-0 . Retrieved August 9, 2013. ↑ Arceneaux, William (2004). No Spark of Malice: The Murder of Martin Begnaud. LSU Press. pp. 95–96. ISBN 978-0-8071-3025-4. ↑ Doughty (1916), p. 150. ↑ Arsenault (2004), p. 203. ↑ Faragher (2005), p. 436. ↑ Arsenault (2004), p. 326. ↑ Johnson, Marc L.; Leclerc, André (March 4, 2015) [February 21, 2010]. "Contemporary Acadia". The Canadian Encyclopedia (online ed.). Historica Canada. ↑ Faragher (2005), pp. 137, 140, 407. ↑ Plank (2001), pp. 115–117. 1 2 Grenier (2008), p. 6. ↑ Plank, Geoffrey (2005). "New England Soldiers in the Saint John River Valley: 1758–1760". In Stephen Hornsby; John G. Reid. New England and the Maritime Provinces: Connections and Comparisons. McGill-Queen's University Press. p. 71. JSTOR j.ctt80b8d.9. ↑ Griffiths (2005), p. 462. ↑ Reid, John G. (1994). "1686–1720: Imperial Intrusions". In Phillip Buckner; John G. Reid. The Atlantic Region to Confederation: A History. University of Toronto Press. p. 84. ISBN 978-1-4875-1676-5. JSTOR j.ctt15jjfrm. ↑ Johnston (2005), p. 164. ↑ Johnston (2005), p. 120. 1 2 Johnston (2005), p. 121. ↑ Scott, Tod (2016). "Mi'kmaw Armed Resistance to British Expansion in Northern New England (1676-1781)". Journal of the Royal Nova Scotia Historical Society . 19: 1–18. 1 2 Basque, Maurice (2011). "Atlantic Realities, Acadian Identities, Arcadian Dreams". In John G. Reid; Donald J. Savoie. Shaping an Agenda for Atlantic Canada. Fernwood. p. 66. ISBN 978-1-55266-449-0. ↑ Carlson, Kathryn Blaze (September 16, 2011). "European settlers sought 'genocide' on Mi'kmaq: historian". National Post. ↑ Calhoun, Charles C. (2004). Longfellow: A Rediscovered Life. Beacon. p. 189. ISBN 978-0-8070-7039-0. ↑ "Acadian Driftwood". The Band. Retrieved July 15, 2011. ↑ "A.J.B. (John) Johnston". Writers' Federation of Nova Scotia. 2012. Retrieved February 1, 2018. ↑ "Acadian Celebrations and Commemorations". Nova Scotia Communities, Culture and Heritage. Retrieved 10 December 2018. ↑ "Acadian Remembrance Day Dec. 13". The Journal Pioneer. December 9, 2009. Archived from the original on September 28, 2011. Retrieved July 15, 2011. ↑ "Home Page". Musée Acadien du Québec. Retrieved July 15, 2011. Carroll, Brian D. (September 2012). "'Savages' in the Service of Empire: Native American Soldiers in Gorham's Rangers, 1744–1762". The New England Quarterly . 85 (3): 383–429. doi:10.1162/TNEQ_a_00207. Johnston, John (2005). "French attitudes toward the Acadians". In Ronnie Gilles LeBlanc. Du Grand Dérangement à la Déportation: nouvelles perspectives historiques. Université de Moncton. ISBN 978-1-897214-02-2. Patterson, Stephen E. (1994). "1744–1763: Colonial Wars and Aboriginal Peoples". In Phillip Buckner; John G. Reid. The Atlantic Region to Confederation: A History. University of Toronto Press. pp. 125–155. ISBN 978-1-4875-1676-5. JSTOR 10.3138/j.ctt15jjfrm.